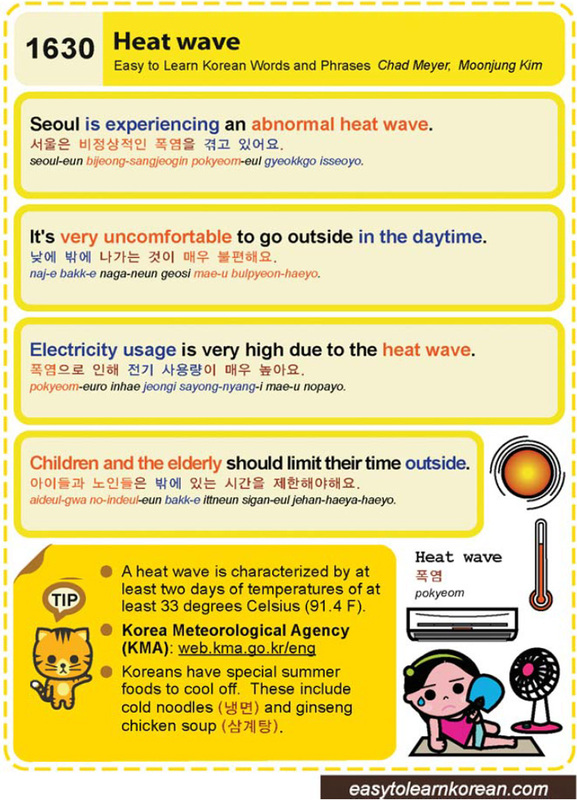 Easy to Learn Korean 1630 – Heat wave. This entry was posted in Series and tagged Children and the elderly should limit their time outside., Electricity usage is very high due to the heat wave., heat wave, It's very uncomfortable to go outside in the daytime., Korea Meteorological Agency, Seoul is experiencing an abnormal heat wave., web.kma.go.kr/eng, 낮에 밖에 나가는 것이 매우 불편해요., 냉면, 삼계탕, 서울은 비정상적인 폭염을 겪고 있어요., 아이들과 노인들은 밖에 있는 시간을 제한해야해요., 폭염, 폭염으로 인해 전기 사용량이 매우 높아요. by easykorean. Bookmark the permalink.